It seems like everyone we know is having a baby or just had a baby. Luckily for me, many of these babies have been boys. 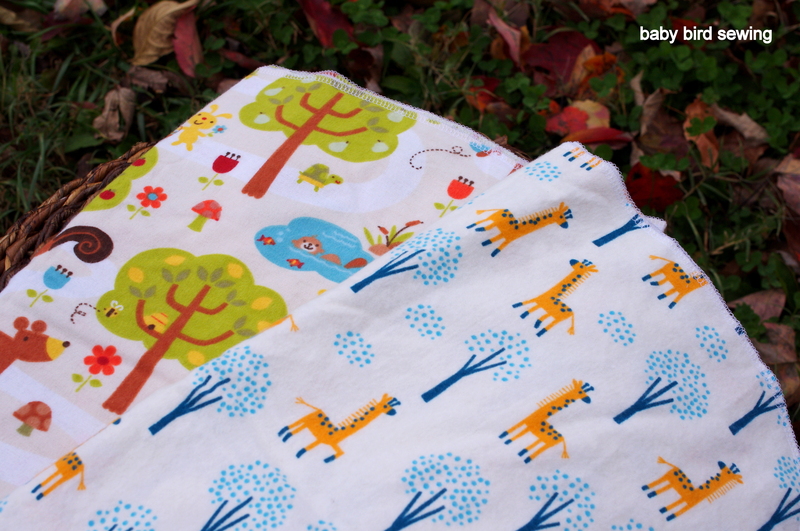 I never sew anything for boys, so it’s a treat to get to pick out boy fabrics once in awhile. I have a little stash of adorable boy flannel prints. I stock up on flannel every year during the Black Friday sale at Joann’s on any and every cute print I can find. 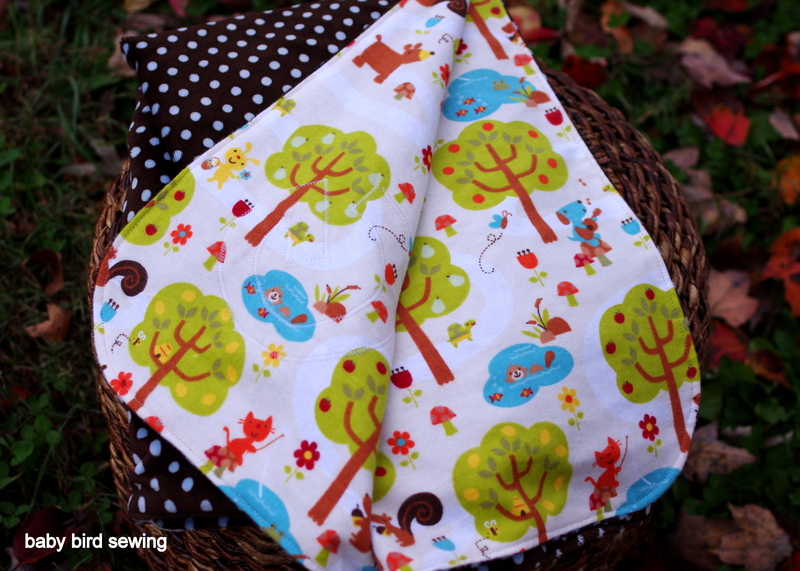 It’s the best price you can find all year and it’s perfect for baby blankets and pajama pants. For the monogram, I found a font I liked on Microsoft Word, printed it out in a size I liked (not too big, not too small), cut out the pattern, and then traced it onto the flannel. To get the letter to stick to the fabric without having to use pins, I used my spray ‘n bond fusible adhesive, which worked pretty great. With the iron on kind, it can feel a little stiff. 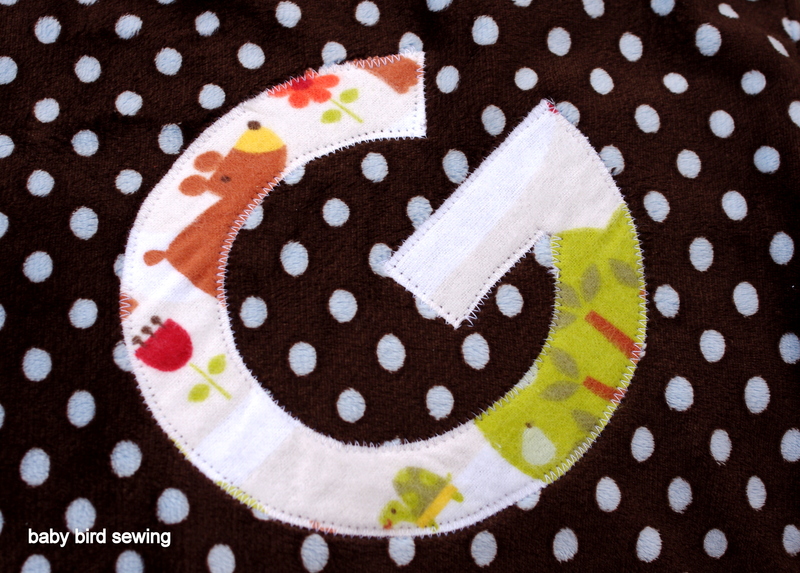 A quick zig zag stitch around the edge of the letter, and there you have it, a soft and cuddly monogrammed baby blanket. I also cut and serged some quick flannel receiving blankets. Most flannel blankets sold in stores are not big enough to swaddle. To make a swaddling blanket, cut off just enough on the sides of the fabric to remove the selvages and then make the blanket at least 36″ long. This size is great for swaddling. 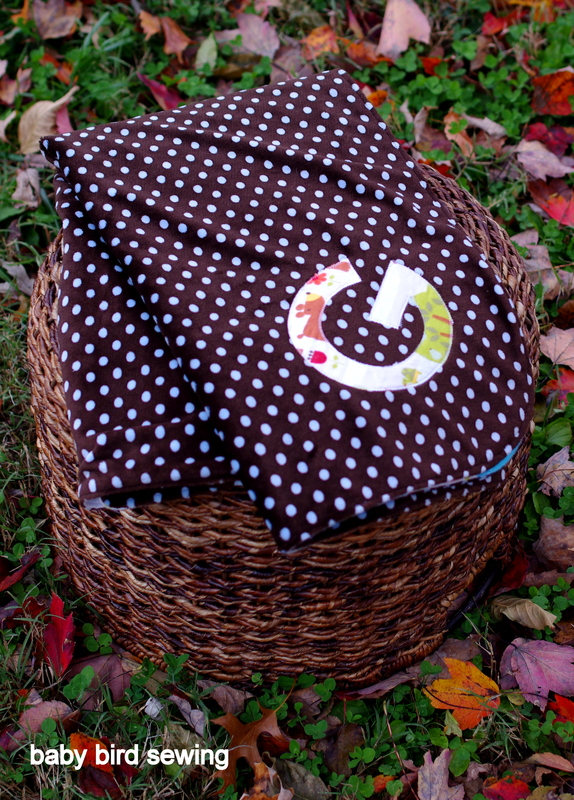 And there you have it, easy and adorable baby gifts. 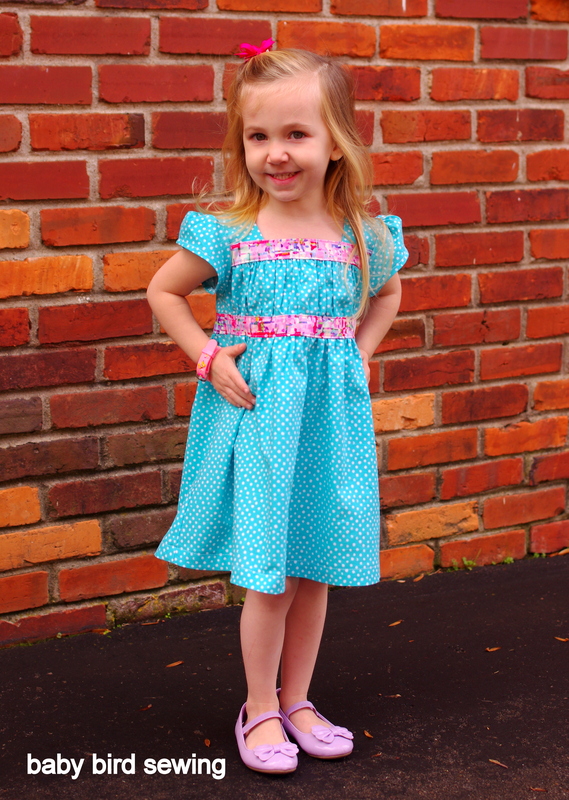 While scrolling through my facebook feed a few days ago, I came across a 20% off promotional code for Oliver + S patterns (coupon code: 4QFEM while it lasts! ), which was pretty great because I’ve had my eye on the Garden Party dress since it was released. I was super excited because as much as I love Oliver + S patterns, they are a little pricey. And I totally get it, they are amazing in pretty much every way. I had to talk myself out of buying two additional patterns by reminding myself I have other Oliver + S patterns that I haven’t even sewn up yet. I LOVE these patterns! And the Garden Party dress is no exception. It’s completely adorable, as all Oliver + S patterns are. Since I just received a new quilting destashing package from my husband’s Aunt Pam a few weeks ago, I thought maybe I could use some prints she sent for my first take on the Garden Party dress. Hannah picked out the fabric combination. She’s starting to get picky these days. I’m finding that they key element is pink! She actually wanted the dress to be made out of the pink geometric fabric that I used for the accent pieces on the front bodice, but I didn’t have a large enough cut of fabric to work with. This dress is not really season appropriate in colors or print, and honestly, it’s a little bold for my taste, but I think she’ll like having a dress that she picked out. 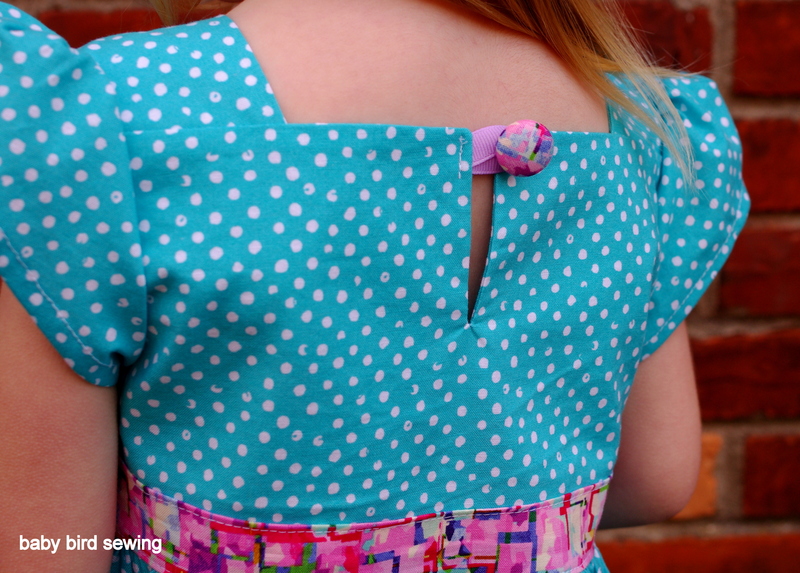 The Garden Party dress is a pretty easy sew that I think would be appropriate for a beginner. The gathers on the front and the general fit of the dress are pretty forgiving. 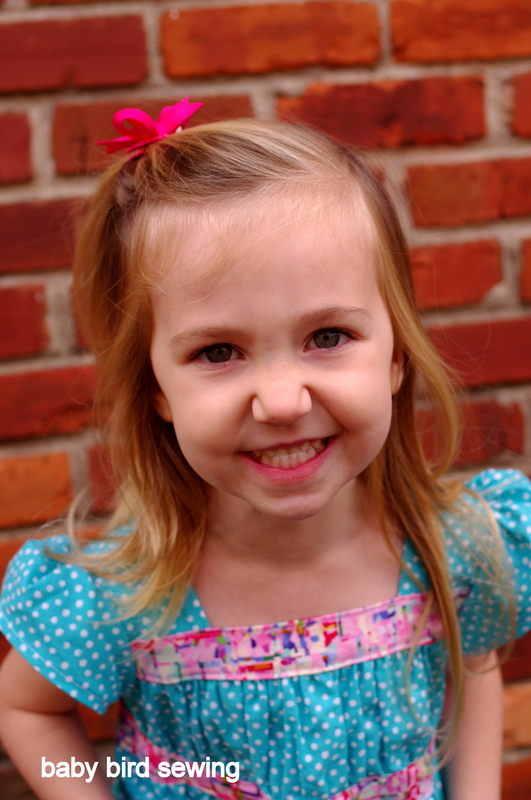 I sewed a size 2T since Hannah is petite for her age. I could probably even go down a size and just lengthen it, but I’d rather make it a little large for her to grow into rather than too small. One great thing about this dress is it can be a bit roomy without looking too baggy. And it fits nicely in the shoulders despite the roominess. After sewing up this dress and seeing how beautifully it came together, I was thinking it might be a great pattern to use for a satin Christmas dress. 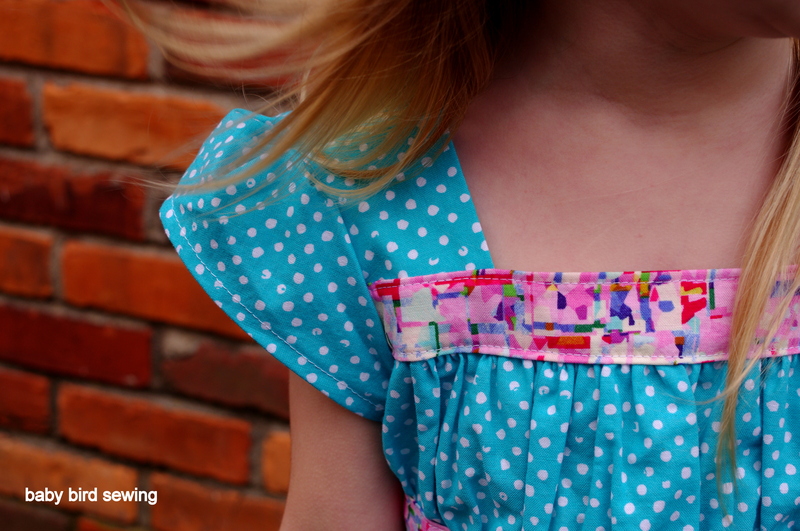 Maybe just use a longer sleeve pattern from another Oliver + S pattern to give it a more formal and winter appropriate look–possibly the Playdate dress sleeve. And speaking of sleeves, they are the only part of this pattern that I’m not super crazy about. They are cute, I just prefer the look of an elastic casing over a fuller, more open sleeve. Although, I suppose that style of sleeve might be really great for a light summer dress. And here is a view of the back closure. 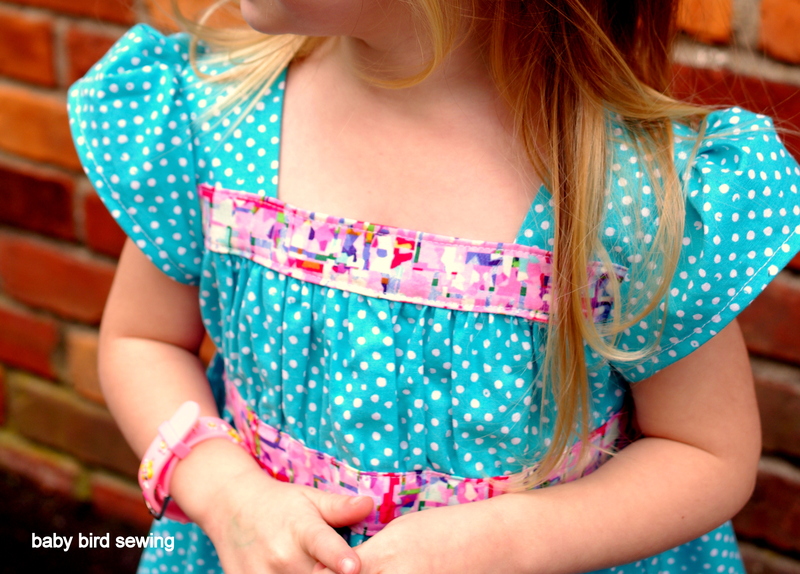 I’m going to sew a thread chain using the Oliver + S tutorial here as the pattern calls for, but for now, a quickly stitched on ribbon will do.